Media Options: CD, flash drive, or download. Available: Usually ships within 1 business day. Download codes emailed within 1 business day. If you're looking for a way to pick the best lotto numbers to win your lottery game, Advantage Gold is the solution. This program uses lotto history, which we provide for hundreds of games around the world, in order to help you find out which numbers have a good chance of hitting in the next drawing and which numbers to avoid. You can use the program's Smart Picks for a fast and easy method, or use any of the charts to look for patterns and choose the numbers yourself. For best results, use Advantage Gold to choose about half the numbers in your game, and then use a wheel (like those in the Wheel Gold programs) to give you sets of tickets to buy that will guarantee you'll win a specific minimum prize. There are no guarantees without using a wheel. Advantage Gold replaces old DOS version program, Advantage Plus (purchase of Advantage Gold also includes a copy of Advantage Plus for those who prefer to use it). Advantage Gold works in all (32-bit and 64-bit) versions of Windows XP, Windows Vista, Windows 7, Windows 8, Windows 8.1, and Windows 10. More than 50 lotto charts and strategy reports help you zero in on the winning lottery numbers. Advantage Gold™ lottery software is much more than a scientific number generator. Depending on how you want to use it, it's the fastest, easiest way to choose your numbers scientifically - or the ultimate lottery software for the serious lottery player who wants to study Lotto numbers in every possible way. You can use whichever favorite charts you've found to be the best indicators of winning numbers for your game. The program has so many ways to strategize, there is something for everyone! 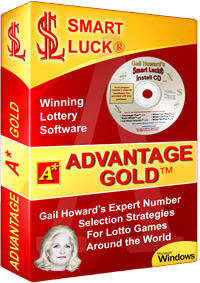 Advantage Gold™ lotto software contains all the best of the famous Gail Howard original methods as well as her latest strategies to beat the newest lotto games. The manual tells you everything you need to know to play lotto more intelligently and scientifically. "I am so happy with your New Updated program; You have hit it out of the ballpark this time. The upgrade is fast, accurate, blazing fast, fun to use, and that is before any Numbers are Picked out! It makes all the other lotto programs - I've tried a lot of them - obsolete and prehistoric." Dan M.
"I have had time to play with the new product and wish to compliment you on the product final result!! I am a retired IT director and find this product to be very intuitive and immeasurable in the information that it provides. GREAT JOB!!" Joe C.
"On a personal note, the visual impact of of this software is something else, love the blues and violet highlight bar, very easy on the eyes. The chart is crisp and clear. ... Can't say enough about the software!!" Kerry O. "Looks like your software A+Gold is a killer !!!! After first day use see the results attached [$1,005 Ontario Daily Keno lottery winnings]." Tom W.
"Firstly the Chart 5b is an astounding percentage helper chart. Well thought out! Chart 3b is an interesting one. I like all the data on one page." Jason M.
"Congratulations for the new version of Advantage Gold. I think it is perfect." Panagiotis G.
Advantage Gold Features: New, Improved, Faster, and Easier! Download Advantage Gold to try the Demo Mode for free. Charts and options are limited in Demo Mode. Nowhere else will you find a more complete set of strategy tools for picking winning lotto numbers. Such great flexibility and wide variety of useful charts just doesn't exist in any other lottery software. New Windows format allows more accessibility - runs on 32-bit and 64-bit Windows XP, Vista, 7, 8, 8.1, and 10. New user-friendly menu driven interface. See Program Screenshots. More chart viewing options including many 3D graph types available than previous Advantage Plus program. View multiple charts at the same time so you can compare data side by side. Tooltip Hints (Hover text popups) to explain each field as you move the mouse over it (option can be turned on or off with right-click menu). Display Settings that include increasing or decreasing font size and changing fonts, displaying or removing divider lines and grid bands, and dozens of graph display options, so you can customize to make the screen easier for you to view. Better handling of Powerball numbers so only one file is needed. New history file properties. The new SLH files can hold more information about a lotto game including links, powerball information, and multiple locations for shared games. New demo mode available - download a limited version to try for free! Advantage Plus compatible - You can use the same keyboard access shortcuts as Advantage Plus, as well as the new drop down menus. Includes or ignores bonus numbers - turn bonus number on or off or even turn the main set of numbers off leaving only the bonus number for analyzing Powerball type games. Charts for individual numbers as well as number groups. Summaries, analyses, and projections for many charts. Ability to change game range throughout. Change settings like sensitivity settings, group settings, etc. Enter and track lotto numbers as drawn (if you enter the numbers that way) or choose to have the numbers sorted automatically (the default for our files). Add new lottery games and drawings or edit existing ones in seconds. Fast speed - lottery program opens and runs in a second and produces charts as soon as they are accessed. Free automatic program updates for the current version from our web site (does not include new version upgrades). 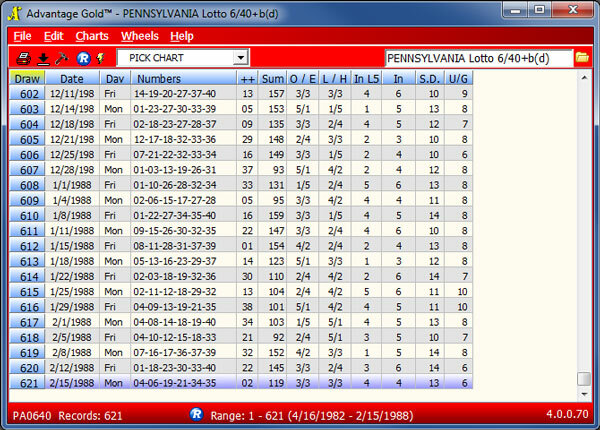 You can view the past performance of Smart Picked® numbers for any chart with just one key stroke (or use the new arrow buttons at the bottom of each chart), going back game by game, throughout the entire history of drawings of any lotto game from Powerball to popular lotto 649 games to keno. This unique, exciting test that reveals the past accuracy of automatic number picks is a major lottery breakthrough!! Spot a Hot Number just BEFORE it gets hot - so you can be on it when it STARTS its winning streak. Know when to play--or when not to play - specific lotto numbers for each drawing. Save money by being able to tell when a number is about to start a long losing streak BEFORE it loses 15 or 20 games or more. Eliminate one-quarter to one-fifth of the lotto numbers in your lottery game, and turn a 49-number Lotto into a 39-NUMBER game. Follow certain easy rules to know how many cold, lukewarm or hot numbers to include on your tickets. Cash in on the most predictable indicator - the balancing Bias Tracker®. Know which of last game's WINNERS have the best chance of winning again the next drawing. Know which of last game's LOSING numbers have the best chance of winning the next drawing. Spot at a glance which numbers are hot and which are not. Avoid buying lotto tickets that are guaranteed to lose. For best results, strategize with Advantage Gold™ to choose a larger group of numbers (about half the numbers in your game's number field is a good range), and then use one of the Smart Luck Balanced Wheel® programs (no wheels are included in Advantage Gold™) or free lotto wheels to produce a set of combinations. Play every combination the wheel produces, and you have a much greater chance of hitting the winning jackpot! See more about wheeling. Advantage Gold™ includes complete data for all pick-5 and pick-6 lotto games (as well as powerball games, some keno games, some pick-7 games, and regular-format pick-4 games) played in all U.S. lottery states and many countries around the world. (Program formerly referred to as usa, international, and keno editions). Advantage Gold™ lottery software CD's, or flash drives come loaded with all of the lotto history results (See the full list of games we track), complete from the first drawing to the day before the program is shipped, and you can download these lotto results free. Note that our winning lottery number files are guaranteed to be updated every Monday, but we do our best to provide new updates daily Monday-Friday. You can enter a lotto drawing yourself if you play a lotto game we don't track or you want to update more frequently than our downloads are available - just follow the instructions here. Minimum Requirements: Advantage Gold runs as a Windows application on all versions (both 32-bit and 64-bit) of Windows XP, Windows Vista, Windows 7, Windows 8, Windows 8.1, and Windows 10 whether these are installed on a PC or Mac. Screen Shots: View screen shots of the Advantage Gold software. Printing: Prints on all printers that print from Windows (See printing help for more). Does not print directly on lotto tickets. Media: Runs on CD or usb flash drive, or takes 300Kb on your hard drive. Note: Downloads are not immediate! COST: $79.95 plus S&H (See Shipping Rate Chart). Returns: Please read this entire product description page and view our Return Policy before purchasing this software. Advantage Gold includes no wheels on its own. If you have purchased a Windows wheeling program from us, Advantage Gold can connect with Wheel 4 Gold, Wheel 5 Gold, Wheel 6 Gold, Wheel 10 Keno Gold, and FFWG programs so you can open wheels and wheel smart picks directly from Advantage Gold. Advantage Gold CANNOT connect to the older version DOS wheeling programs like Wheel 4 Plus, Wheel 5 Plus, Wheel 6 Plus, Keno Wheel, and Full Wheel Generator. If you own these older programs, you can purchase an upgrade to the new Windows wheeling program for $15 each. Otherwise, purchase of Advantage Gold does include access to the older Advantage Plus program which can connect to the DOS wheels, so you can still use them this way if you do not wish to upgrade. Advantage Gold works for pick-3 through pick-20 lottery games, including Powerball and games with bonus numbers. It requires a history file to work for the game, so it works for any game we track. If your game is a regular format that we do not track, you can enter drawings yourself into a new game file. Advantage Gold IS NOT FOR: Daily Number 4-Digit Games. Advantage Gold is NOT designed for the 4-digit games 0000-9999, which have winning numbers such as 0123 or 9876 or the 3-digit games 000-999, which have winning numbers such as 944 or 182. The software cannot accept 0 as a number or duplicate numbers in a drawing. Please refer to the Lottery History Files page for the most complete listing and to download lotto results. Advantage Gold is the lottery strategy software that works for ALL of the United States and international lotto games listed below. Click the state name to view the best products for your state, or click the game to view free tips. Please use the new Advantage Gold Manual and the Quick Start Guide to get familiar with the program and understand all the features. Don't forget to view the section towards the ends of the manual, "Smart Luck Secrets of Winning" to see our tips on the best charts to use and how to use them quickly for the best results. We are still working on the built-in help for the program, so it is not complete yet, but as we finish more of the help, it is added to the free updates. The program does have extensive tooltip hints which explain almost every field in the program, so you will easily know what the data is telling you. This can also be turned off once you are familiar with the program (right-click and choose Turn off hints). Build the perfect lottery software package for your game! Special Savings: Take advantage of our great discounts for lottery software when you buy Advantage Gold and/or another wheeling program with your Advantage Gold order (excludes upgrades). Save at least $20 off your total (up to $70 savings)! If you purchase Advantage Gold™ (new or upgrade) and choose flash drive as your media option during checkout, flash drive will include Advantage Alert audio tutorial mp3 files. This tutorial was created for the older DOS version, Advantage Plus, but it still contains useful information about using the charts, even though the exact steps for using the software are not the same as the tutorial.